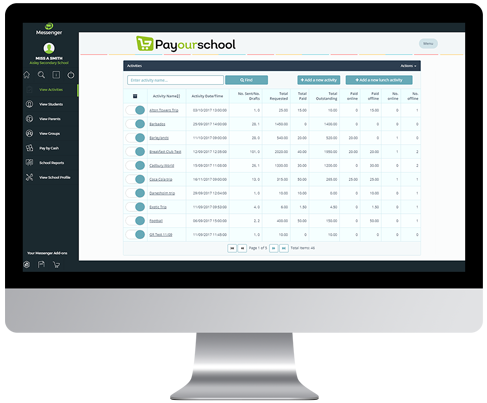 PayOurSchool helps you to manage your school’s cashless catering top-ups in just a few simple steps. You will only be able to create one active lunch activity at a time (you can create more, but start/end dates cannot overlap). Parents will be able to continue topping up the balance for their children via Xpressions until the activity reaches the end date that you have set. 1) From the PayOurSchool interface, click on from the View Activities Dashboard. Enter the required details (field with an *asterisk) for the new lunch activity: Cashless Top-up Name, Recommended Top-up Amount, Cashless Window Start and End Date, Ledger Code and Transactions Category. To make things easier for parents, enter the amount that you would recommend parents pay for their child’s cashless catering. The amount needs to be typed in the format: #.##g. 10.00. As you will only be able to create one cashless activity at a time, parents can top-up their child’s balance via their Xpressions for as long as the Cashless Window stays open. Click here for how you can update the cashless balance of students who have paid with cash/cheque. Currently this is the only category available (more categories may come available in the future for different features). Once you have entered the required information in the Activity Details panel, click from the bottom of the panel. From the final step, you can choose to attach files to the payment request that is sent to parents. Please note, any attached files will be sent to all parents, and as such must not include any personal information. Once you are ready to add the Cashless Activity to all Parent Portals, click . Top Tip: Creating a Cashless Activity will be automatically assigned to all students, so you won’t have to take any steps to assign it to students/groups. Payments are voluntary and all parents will see the lunch activity on their Xpressions Timeline until the window you have set closes. For more on how parents see Cashless Activities, click here. Once you have created a Cashless Activity, parents can begin making payments to top up up their child’s lunch balance. You will be able to keep an eye on the payments being made by viewing the lunch activity from the View Activities Dashboard. 1) You can access your View Activities Dashboard by clicking on the Menu in the top right corner, then clicking Activities/Payment Request. 2) In the search field on this page, type the name of the lunch activity and click Find. 3) Once you have located your Lunch activity, you can on the Activity Name (from the first column) to view the details in full. 4) Information for the Cashless Activity will be broken down into different panels. Further information, and the actions you can take from each panel, are listed below. Once you open a lunch activity, you will be taken to the Payments tab. From this tab, you will see a list of students that have paid for lunch so far, as well as their Current Lunch Balance. Use the search field at the top of the panel if you need to view a specific student. Click from the top of the page to send a group message to the primary contacts of students who have made a payment for cashless catering so far. To add any notes to individual students, click on the icon from the last column. Click from the bottom right of the panel to download the list of payments as a csv. The Summary tab provides a high-level view of payments for the lunch activity you are currently viewing. Important information includes how much money has been paid in total for the lunch activity so far, as well as the amount of payments made online/offline. The Activity tab displays details including the name, cashless window period, and recommended top-up amount. Once an activity has been created and invoices issued (not a draft activity), the ledger code and transactions category cannot be edited. To edit any of the other details for an ongoing cashless activity, click Edit from the bottom right corner. If you make any changes, click .